I was going to call this post a Trio of Love, but I thought that sounded a little smutty, then again a Trio of Smalls could be minimalistic packing for a weekend away! 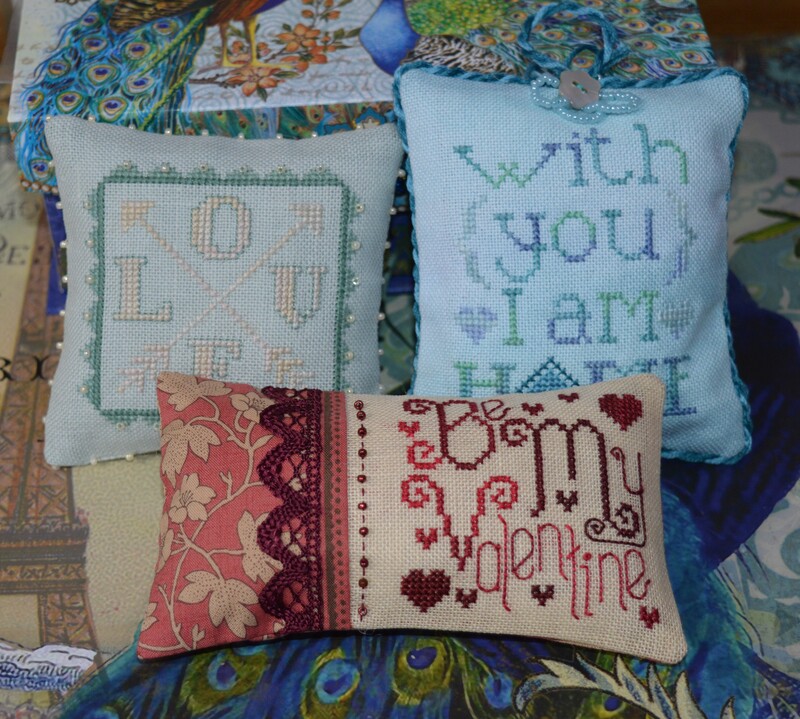 Anyway, titles apart, I’ve just finished three little cross-stitch smalls. I got inspired by the cross-stitch smalls group on facebook, they are having a valentine special, so all these cute hearts kept appearing. I decided to do some simple, quick to stitch smalls for next month. 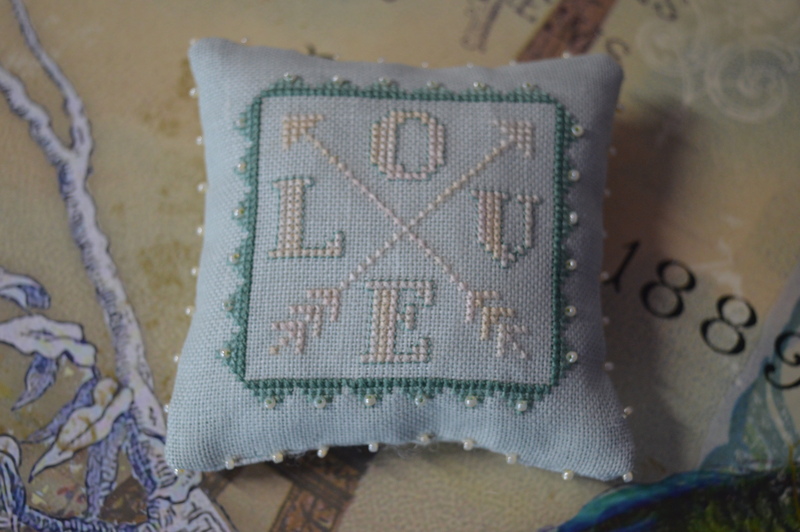 The first one to stitch was by Hands On Design, it’s a free pattern designed to celebrate her wedding anniversary. The photo shows it stitched on a beautiful fairly dark blue/grey colour with the central design in an ivory colour. I sometimes wish the linen companies would do like a layer cake of 10″ squares of different colours to try, they would be perfect for little cross-stitch projects. Instead I rummaged through my linen box and chose a soft duck-egg blue sort of colour, very pretty. I decided to use a variegated cream for the letters and two shades of teal for the border. I really wasn’t sure about the cream whilst I was stitching it. I think it depended on the light I was stitching in. I loved the subtlty of the cream on duck-egg, but sometimes it just didn’t show up enough. With hind-sight I think the problem is more the two shades of teal, the inner one is too much of a contrast, but I’m not one for frogging unless provoked, so instead I outlined the cream in a single thread of teal which just gives it a bit more definition without losing it’s delicateness. I still felt it needed something else, so I stitched some tiny pearl beads round the border and then echoed them on the outer edge of the small. I like it, it’s pretty without being too frilly. The second small was also by Hands on Design, a freebie from last year to celebrated another wedding anniversary. 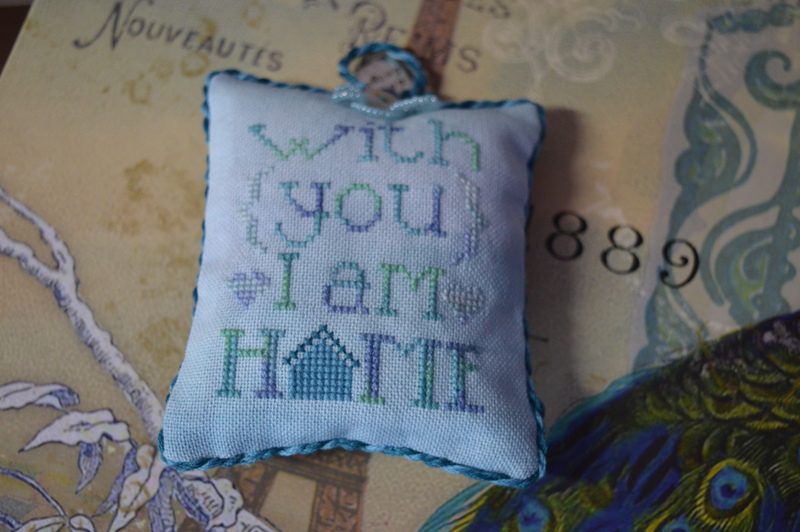 This one is called I am Home, I changed the thread choices again to fit the linen colour. This time I used a lovely dyed linen by Sparklies, I picked up a couple to try at the Festival Of Quilts, I’m tempted to try a few more as they are lovely to stitch and I love the effect of the spacedying. This one is in soft shades of blue and green. I decided to use one of my favourite DMC threads for the main lettering, 4030, it’s a wonderful blend of blues and turquoise / green. It worked really well with the linen. I made one small change to the design. I must admit when I first saw the pattern I did wonder why there were bracket signs on it and arrows like signposts. I could live with the brackets, but I changed the arrows to hearts. It was only later that I realised it was probably a modern take on bows and arrows…it went straight over my head! The pattern also gave instructions to make it into a house shape with a fabric roof, I decided to keep it to my usual oblong. I made a cord to go round, added a button to cover the join and then felt it needed a bit more! 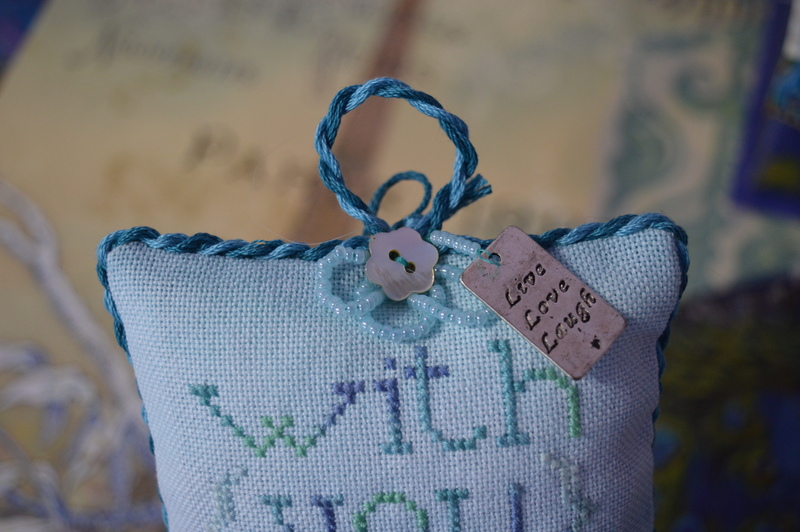 I added a charm which says Love, Live, Laugh which I thought was quite apt, on the grounds that things look more balanced in an odd number I added some loops of beads…it was one of those times when I wasn’t quite sure when to stop! My third cross-stitch small is a design by Sandra Longan, it’s a free pattern from 2014 which I found on pinterest but managed to trace back to her website. I stitched it in one of the original DMC variegated threads inrich dark reds. The shading worked really well with Valentine all being in a lighter shade. I was stitching this when I visited my mum this week, she looked at the pattern and said “It doesn’t make sense, Be My Dentine”!!! It’s one of those comments that sticks in your head, now all I can see is dentine! I decided to make this one rectangular with a piece of co-ordinating cotton. I tried about six possible fabrics, a couple matched beautifully colour-wise, but they were just too busy and dominated the design. Eventually I decided on this more muted one. I added a line of running stitches and beads and a length of pretty lace. I decided this one had enough and didn’t need an edging. I’m really pleased with my little cross-stitch smalls, they’re quite addictive! Linking up with Kathy’s Quilts for Slow Stitching Sunday, a celebration of all things hand stitched. Follow the link for more hand-stitching inspiration. 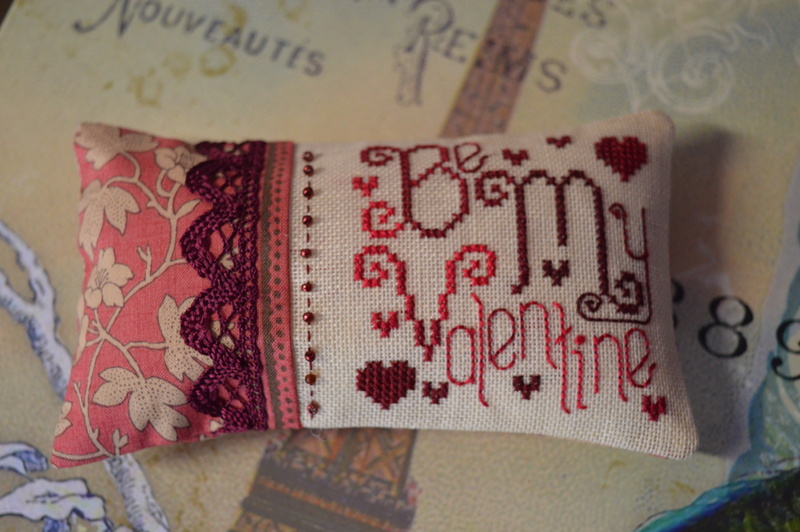 This entry was posted in embroidery, Serendipity and tagged cross-stitch, Cross-stitch smalls, Valentine's Day. Bookmark the permalink. I love your cross-stitch smalls!!! I think your smalls are darling. Anyone would be happy to receive them. I think the first one was perfected with the light blue around the letters. It really made them pop. lovely finishes – I especially like the red one with your extra line and beads to the left. These are all adorable! Love that the patterns are all free – thanks for the link. I try to use the free patterns too, and I like the smaller projects much better than the larger projects. Gorgeous – love all the little details. Utterly charming, love the bows/brackets, signposts/arrows conundrum! Small to me mean knickers. It was an expression of my Mum’s, as in washing your smalls…. Thanks Cathy, it means knickers to me too usually, the facebook page I’m in is called All About Smalls. I love the sentiment on the second small. Great projects! When I need something small, all I have to do is go through you blog and I’ll find exactly what I’m in the mood for. ❤️ your collection, Margaret! Your smalls are beautiful. I look forward to days when I just pick up a chart and finish it quickly. I really like your finishes too. All three are really precious! Good job! I have ventured away from cross stitch in recent years due to failing eyes. But now have magnifiers that fit my glasses….I need to get back to counted cross stitch. I do love it!